[157 Pages Report] Real-world evidence is the clinical evidence regarding the usage and potential benefits or risks of a medical product derived from the analysis of real-world data. Real-world data (RWD) is defined as data derived from a number of sources that are associated with outcomes in a heterogeneous patient population in real-world settings. The global real-world evidence market is valued at 612.0 million in 2017 and projected to reach USD 1,348.1 million by 2023, at a CAGR of 14.3%. The growth of this market is majorly driven by the rising geriatric population (and the subsequent increase in the prevalence of chronic diseases), shift from volume- to value-based care, and delays in drug development (and the subsequent increase in development costs). The base year considered for the study is 2017 and the forecast period includes 2018 to 2023. The prominent players in the global real world evidence market are IQVIA (US), International Business Machines Corporation (US), ICON (Ireland), PAREXEL (US), Pharmaceutical Product Development (US), Optum (US), Cognizant (US), Oracle (US), SAS (US), Syneos Health (US), Anthem (US), Clinigen Group (UK), Palantir Technologies (UK), and Flatiron Health (US). The global real world evidence solutions market is projected to reach USD 1,348.1 million by 2023 from USD 689.9 million in 2018, at a CAGR of 14.3% during the forecast period. The growth of this market is majorly driven by the rising geriatric population (and the subsequent increase in the prevalence of chronic diseases), shift from volume- to value-based care, and delays in drug development (and the subsequent increase in development costs). The report analyzes the global real world evidence solutions market by component, therapeutic area, end user, and region. On the basis of component, the data sets segment accounted for the largest share of the global market in 2017. The large share can be attributed to factors such as easy availability of massive amounts of data, increasing dependence of outcome-based studies on real-world data, and rising demand for information by payers and providers regarding drug safety. Based on therapeutic area, the real-world evidence market is broadly categorized into oncology, neurology, immunology, cardiovascular disease, and other therapeutic areas. The oncology segment accounted for the largest share of the market in 2017. The large share of this segment can be attributed to the high number of clinical trials conducted for oncology and the rising prevalence of cancer worldwide. Based on end user, the real-world evidence market is segmented into pharmaceutical & medical device companies, healthcare providers, healthcare payers, and other end users (academic institutions, patient advocacy groups, and health technology assessment agencies). The pharmaceutical & medical device companies segment accounted for the largest share of the market in 2017. The large share of this segment can be attributed to the increasing importance of RWE studies in drug approvals, the need to prevent costly drug recalls, and the increasing need to assess drug performance in real-world settings. 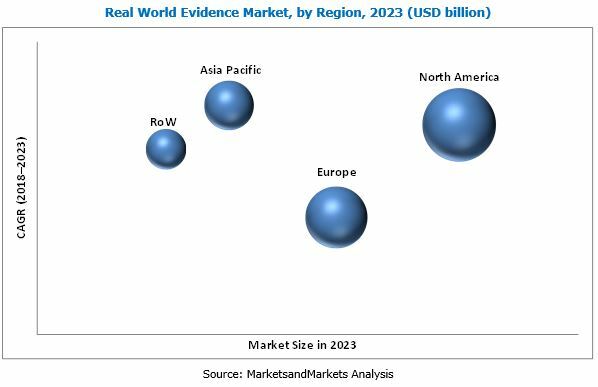 The real-world evidence market is broadly segmented into four major regions, namely, North America, Europe, Asia Pacific, and the Rest of the World (RoW). In 2017, North America accounted for the largest share of the market, followed by Europe and Asia Pacific. Presence of a favorable regulatory environment, high number of RWE service providers, the presence of a well-established pharmaceutical industry in the region, coupled with the high R&D expenditure, are the major factors responsible for the large share of North America in the global real world evidence market. The rising focus on end-to-end RWE services and growth opportunities in emerging markets are expected to provide further growth opportunities for players operating in the real world evidence market. However, the reluctance to rely on real-world studies and the lack of universally accepted methodological standards for data collection some of the factors limiting the growth of this market during the forecast period. The prominent players in the global real world evidence solutions market are IQVIA (US), ICON (Ireland), PAREXEL (US), Pharmaceutical Product Development (US), Optum (US), International Business Machines Corporation (US), Cognizant (US), Oracle (US), SAS (US), Syneos Health (US), Anthem (US), Clinigen Group (UK), Palantir Technologies (UK), and Flatiron Health (US). IQVIA is one of the world’s leading providers of real-world evidence services with a wide geographical coverage. The company’s strong foothold in the market is primarily attributed to various factors such as its robust technical and service capabilities, good client relationships, diversified service offerings, and its ability to enhance the penetration of its offerings. IQVIA has registered significant growth serving providers, payers and the biopharmaceutical services industry, and has a presence in all major markets, including the US, Japan, Germany, France, Spain, and Italy, in addition to Brazil, Russia, India, and China (BRIC countries). To increase its geographic presence and customer base, the company focused on mergers and acquisitions as a key growth strategy. Over the past three years, the company has made three major mergers and acquisitions.